Mr Ben-Ari has faced criticism over his comments about Israeli Arabs. 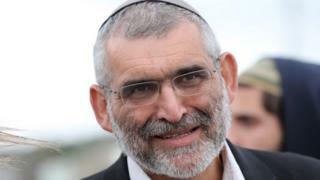 Attorney General Avichai Mandelblit has said they amount to "incitement to racism". Ahead of the elections, Prime Minister Benjamin Netanyahu had forged an alliance with several far-right parties, including Jewish Power, to try to shore up support. The long-serving prime minister also faces a serious challenge from the new centrist Blue and White alliance led by ex-military chief Benny Gantz, which is polling just behind Likud. All governments in Israel are coalitions because the country's system of proportional representation makes it unlikely for single parties to be able to govern alone. The Times of Israel website reports that the appeal cited Mr Ben-Ari from August 2018, saying: "We have to change the equation regarding anyone who dares to speak against a Jew. "[Such a person] is a dead man. He must not come out alive. No expelling him, no stripping him of his citizenship. He does not live! A firing squad takes him out as the Arabs understand [best]." Mr Ben-Ari has claimed that he was referring to Hamas leadership - not all Arabs. And responding to Sunday's court ruling, he said: "There is a judicial junta here which wants to take over our lives. "They tell you there is a democracy here. It's not a democracy, there is a judicial junta here, unfortunately, which took power into its hands." What does it mean for the elections? It is unlikely to affect the polls, as other members of Jewish Power are still allowed to run. Candidate Itamar Ben-Gvir was approved on Sunday to stand in Mr Ben-Ari's place. The court's decision marks the first time that a single candidate - not an entire party - has been banned from running in elections since electoral law changes were adopted in 2002. Prime Minister Netanyahu's decision to partner with Jewish Power received rare criticism from pro-Israel lobby groups in the US - Aipac and the American Jewish Committee - who described it as a "racist and reprehensible" party. The ultra-right party includes disciples of the late anti-Arab extremist rabbi Meir Kahane, who led a right-wing fundamentalist group in the 1980s that advocated attacks on Arabs, and was later outlawed under Israeli anti-terrorist legislation. Israel's Supreme Court also approved on Sunday a candidate from the radical socialist Hadash party, and overturned a ban on an Israeli-Arab alliance called Raam-Balad, which had been accused of links to Palestinian militants.